As most of you probably know, Governor Perry released his first TV ad of the campaign season earlier this week, and I think it is great! The ad was very positive, very welcoming and forward-looking, and of course stood on Governor Perry’s solid record of positive economic growth in our state despite the national economic downturn. Unfortunately, some people are just too negative and partisan to be thankful for the economic environment here in Texas. 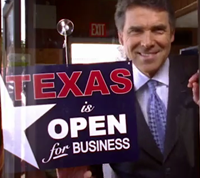 Earlier I heard some of the owners of the stores used in the video do not support Governor Perry. Surprise surprise–they’re from Austin and of course wanted to complain! Can’t these store owners just be thankful their governor isn’t someone like Jennifer Granholm (D-MI)?! Yes, it is fine and normal to disagree with your governor. A governor can’t make everyone happy, but these store owners should be glad they’re still open for business. Whether or not you like Governor Perry, we here in Texas should just be thankful Texas is not in the same situation as Michigan, Ohio, Nevada, or California. I’m not hating on those states; I actually feel for those people who have lost their homes and/or jobs in those states. I’m just tired of those liberals here in Texas who just can’t accept our way of doing business has helped us avoid a great amount of economic damage. So you don’t like Governor Perry? That’s fine, but then who are you going to thank? The Republican Texas Legislature? I believe that it is just that most Texans are common sense conservatives who understand liberal policies, like those held by President Obama and Bill White, are harmful to small business and discourage success. Regardless, whomever you chose to attribute Texas’ economic successes to, it all comes back to the fact that we don’t take too kindly to bigger government or higher taxes. At the end of the day, those store owners complaining about being in Governor Perry’s very positive and forward-looking TV ad need to thank their lucky stars they are at least, as the ad says, “open for business,” and in order to keep it that way, we need to make sure that Bill White doesn’t get in our way.